The trails to the south of Otter Creek Road are walked less than the ones to the north of the road. For other comments see Otter Creek Road. The South Cove and South Lake trails, when combined, make a great loop. 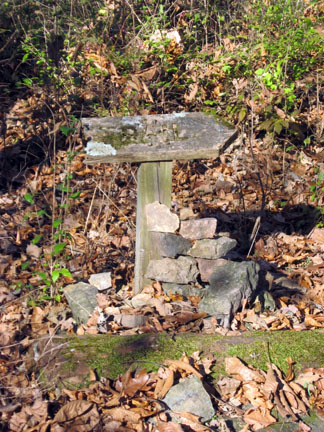 The trails' starting points are inside the Park and must be approached by using other trails. Starting from the west, hike east on Otter Creek Road .20 miles. The South Cove and South Lake Trails start on the right. There is a sign at the junction. South Cove and South Lake trails junction. Starting from the parking area (east), hike west on Otter Creek Road .35 miles. The trails start off to the right, immediately after the Hall Drive intersection on the left. The trail seems to be a bit easier when hiked counter clock-wise. To avoid having to tell the same tale twice, the description will cover the South Cove Trail from west to east and then the South Lake Trail from east to west. Trail sign at top of ridge, the arrow is pointing down the hill. After hiking the Otter Creek Road from the west, the South Cove Trail turns right off of the road. The South Cove Trail branches to the right and begins the climb to the ridge. After a couple of switchbacks the grade becomes easier. While continuing to climb, the trail contours to the left, inside a hollow, then back to the right to a switchback onto an old road. A final 50 feet of elevation gain brings the trail to the ridgeline. The total climb is 250 feet. One of many benches on the ridge. Following the ridgeline, the trail continues as it searches for the line of least resistance. In the fall and winter, there are beautiful views of the lake and surrounding hills. The trail stays high on the ridge for a quarter of a mile. At about .20 miles along the ridge there is another bench located off on a spur to the right. Continuing onward, the trail descends shortly. 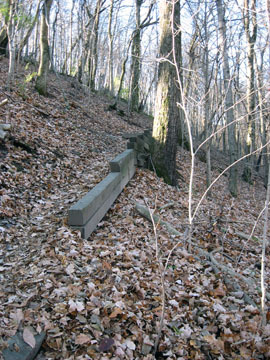 A steep section of the trail. Leaving the ridge, the trail drops steeply for a couple hundred feet toward the Lake. After a set of switchbacks the grade eases a bit as the trail and comes to a junction located .80 miles from the trails beginning at Otter Creek Rd. Turn right to continue on the South Cove Trail. The new bridge is crossing a ravine is located just a few hundred feet away. Continue over moderate terrain for .35 miles to the intersection with the South Lake Trail (it is .10 miles to the right to Otter Creek Road). Turn left at the junction to join the South Lake Trail. Hovering above Otter Creek Road, the trail contours into two hollows in order to avoid some small ponds. The trail is not as flat as the Lake Trail; but it has no substantial climbs. 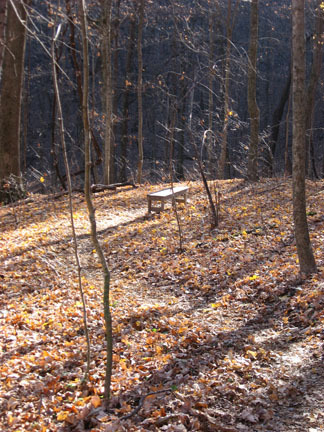 The South Lake Trail is rated as moderate. From the trail junction, it is .20 miles around the first pond, to the first spur trail which leads right to the Otter Creek Road. Joining the South Lake Trail from the South Cove Trail. Continuing ahead, the trail shadows Otter Creek Road with good views of the Lake in the fall and winter. In .15 miles a second spur trail enters from the right which leads sharply downhill to the road. In .05 miles the trail reaches the junction with a short trail that accesses the South Cove Trail at the junction mentioned above. 1st pond from South Lake Trail. The trail leaves the road and travels around the second pond. Clearing the second pond, the trail continues above the road and contours around the slope for the remaining .40 miles of trail. At the final junction with South Cove Trail and Otter Creek Road, return to the west side Parking Area by turning left and hiking down the hill for .20 miles.